Took these while we were in Newport, RI last week. It was much too cold to wear the dress alone. Although, I wish I had, just for the pictures because I'm not really feeling the jean jacket... eh.. whatevs. If you ever visit Boston, I highly recommend driving to Newport for the day! It's absolutely breathtaking. **I'm leaving for Europe for two weeks and will not be updating while I'm there. See you when I get back! Peace out America! O modelo, as cores... é todo lindo! You look like a beautiful princess, Khatu. 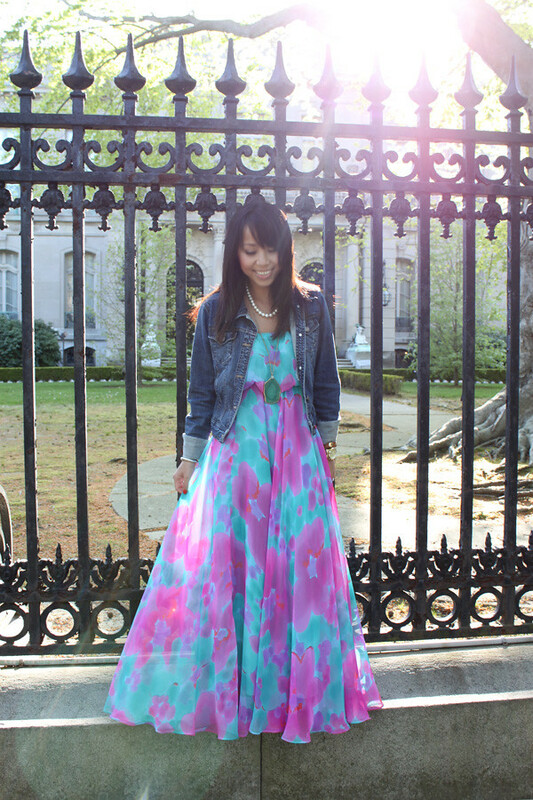 To be honest, the denim jacket is a cute touch to this lovely dress you've reworked. Only thing better than this jacket would be if you wore a denim bolero or maybe a cute shrug. Otherwise, this is a lovely look. Enjoy your European trip! Be safe and have fun! I love this dress even more now.. and I dig it with the jacket. "See" you when you get back. That dress is the absolute perfect length, super flattering for you. I'm so in awe. Can't wait to see you style it again when it's warm! Oh no, I love it with the jean jacket! I am a jean jacket lover, though! I especially love them with super feminine dresses like this! The dress and jacket combination looks so good! amazing location..
i dig the necklace super cool! this dress is absolutely gorgeous and i actually really like it with the jean jacket! have fun in Europe! Your hair looks SUPER gorgeous in these photos, lady! Have an amazing time in Europe! Loving the dress! Wow, what a great job tailoring it from the previous look. Sooo pretty! Love the colours of your dress! I really hope you have a good, good time, Khatu! That is such a stunning dress!gorgeous. Looking gorgeous! Jacket or no jacket, the dress is still fab. I'm curious as to where in Europe you're going, but I guess you'll tell us once you're back :) Have fun! I love that you could wear that dress to a BALL or wear it w a denim jacket around town. You look GORGEOUS. The scenery is beautiful...with the sun brightly shining...great shots. OMG that dress is gorgeous! love those colors on your dress! I agree! You can be stylished and you look like a princess!!! Love te dress!